It was 6 o'clock in the morning when the boat train pulled into Hamburg. The vast, echoing station was half deserted in the dawn light and my friend Dot and I staggered out on to freign soil, giddy and bewildered from lack of sleep. We couldn't understand the German announcements or the written signs but, clutching our suitcases, we started to walk uncertainly up the platform. Suddenly, above the clanking trollies and rumbling engines, came a commotion of Liverpool voices. The next minute four crazy figures in black leather jackets and blue jeans burst round the corner and came leaping down the platform towards us. It was John, Paul, George and Stuart Sutcliffe just released from their all-night rock'n'roll stint in a local club, drunk as skunks, but nice drunk. They surrounded us, giggling, screaming and jumping about like excited kids on the last day of term. John gave me a great hug, Paul embraced Dot who was his girlfriend at the time, then they seized our suitcases and swept us away for a massive fry-up breakfast at the Sailor's Mission. I held John's hand very tightly. I couldn't stop smiling, neither could he. It was so good to see him again. Though we wrote to each other every day - John's letters to me were emblazoned on the back of the instructions: "Postman postman don't be slow. 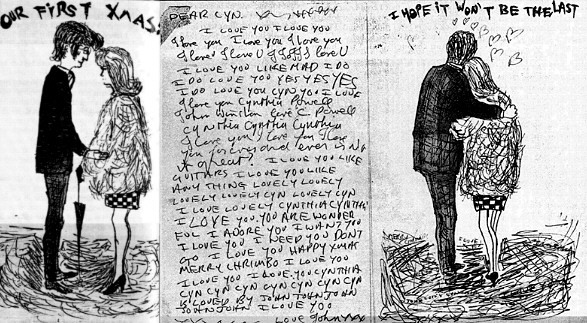 Go to Cyn man, go man go..." - letters were no substitute for actually being together. Somehow, improbable though it might seem, we were madly in love. I was still not exactly sure how it happened. I mean the first time John asked me out I turned him down. We were complete opposites. I was hard-working, dedicated to my college course and determined to pass my exams and qualify as an art teacher. John, on the other hand, was rebellious, sarcastic and couldn't care less about his studies. yet when we returned to art college after the end of term party at which I'd rejected him, the attraction between us was stronger than ever. Gradually we found we were spending more and more time together. At lunchtimes when a group of us wandered down to The Crack for a Black velvet (Guiness and cider) John ended up by my side and after college we often went for a coffee. Soon we were sitting for two hours over a single coffee in a transparent cup, gazing into each other's eyes and talking intensely. I discovered that on his own, away from the cronies to whom he was always trying to prove himself, there was another John lennon. He was full of pain, full of anger. His father had gone off to sea years ago and his mother, unable to cope, had left young John with her older childless siter, Mimi. Though Mimi had done her best and was devoted to John, he still felt deserted. Then, when he was 17, just as he was getting to know his mother again, she was run over and killed by an off-duty policeman right outside Auntie Mim's house. In a way he'd lost his mother twice. At the time I was too young to understand the psychological impact this must have had on John but I was dimly aware that his unhappy past explained a lot. I'd noticed John's main talent was as a cartoonist. Even as a boy he'd filled excercise books with pages and pages of cartoons, but they were all grotesque, distorted versions of human beings. He drew distorted people just for the fun of it, because I think he was distorted inside. He didn't want people to pity him so he made them laugh instead. As I say, I didn't understand a lot of this at the time but one thing I did know about was the agony of loosing a parent at 17. I still missed my father desperately and in a strange way I felt abandonned, too. It was another bond between us. In a very short time I knew that John was special. The physical attraction between us was so strong that we were in each other's pockets the whole time. We skipped class and went to the pictures and sat in the back row not watching the film, or else we'd skip off college again and get the ferry to new Brighton and sit on the sand dunes. Later we'd go to this coffee bar at the top of Bow Street and hold hands for hours. At weekends I caught the train back to Liverpool for more dates with John. he was always late, of course. I used to wait for him at Liverpool Central station and I'd stand there all dressed up and waiting and he'd be 15 minutes or half an hour late and the first thing he'd say was. "Have you got any money for ciggies?" yet I couldn't be cross. I was so glad to see him. John made me laugh but he also embarrassed me to the bottom of my boots. On top of the bus if we happened to be sitting behind a man with a bald head John would lean forward and very gently tickle the bare scalp with his finger. The poor victim would keep brushing his head, thinking it was a stray hair, until I was in an agony of suppressed giggles and horror combined. I didn't know where to look. Then on leaving the bus John would asopt an exaggerated limp, or pecuilar gait, and parade up the pavement for the entertainment of the rest of the passengers looking out of the window. I loved John dearly but sometimes I thought he was completely crazy. He had to have an audience, any audience to make up for all the love he felt he'd lost. yet despite this we seemed to complement each other. I think I had a calm about me that he needed, while for me his madness was stimulating. Oddly enough in those days there must have been some physical similarity between us too, because people kept mistaking us for brother and sister. Or maybe it was justthe glazed expressions we both wore through walking around so short-sighted! In love with John I was completely happy, but my best friend Phyllis was appalled. I didn't see quite so much of Phyl these days. Her mother had died and Phyl had had to leave college and go out to work to help support the family. We still kept in touch, but sporadically just then, and by the time Phyll heard about my relationship with John there was no turning back. She was horrified. "He's no good for you, Cyn," she warned me. "He's trouble." But by then it was too late. I was in love. She was right of course. Deep down I knew it. I knew my dad wouldn't have been happy about John. I knew Dad would have advised me against him and perhaps I would have listened. But Dad wasn't there and Mum was still too weighed down by her own grief to guide me. So I plunged right in and went for broke. Mum for her part was very understanding. If I cared she wasn't going to spoil things. If I was happy that was good enough for her. Yet she was worried, too. Much as she tried to like John for my sake she couldn't see any prospects for him. What future we could possibly have together she just couldn't imagine. Nevertheless, since it looked as if things were serious between us, a formal meeting had to be arranged between the two guardians. One afternoon John and Mimi came to tea. It wasn't an easy occasion. Mum and I cleaned the house and tinned salmon sandwiches and cake were laid out in the front room. John arrived all dressed up and on his best behaviour with a thin, smart woman with strong, fine-boned features very like his own. Auntie Mimi was polite but frosty and we all sat round the table and discussed the weather. She couldn't say so of course, but Aunti Mimi didn't like the situation at all. 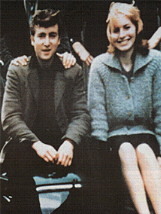 She was very posessive of John and jealous of anything that threatened to take him away from her. His friends were bad enough but a girl was even worse. It was a stiff, difficult afternoon which none of us enjoyed but the formalities had been observed. The two families had been introduced. All this time as I struggled to make a success of my course despite the diversion of John, he was more involved in his music than the artwork. At lunchtime two of his friends from the school next door - young Paul McCartney and an even younger george Harrison - often came to the college to practice. We'd go out and get hot, salty packets of scallops and chips and take them back to the college stage which happened to be in the canteen. Ignoring the other students sitting at the tables we climbed through the curtains and sat there in privacy eating our lunch while the boys practiced their chords and harmonies. Even then, just chinking away at their favourite Buddy Holly numbers, I thought they were great. Immature and amateur though they were, their singing sent tingles up my spine. In those days Paul and George seemed very skinny, quiet and young. I was the eldest, followed by John, a year younger than me, then Paul and finally George who was probably only 15 or 16 at the time and a real schoolboy in my eyes. yet despite the difference in their ages they all got on very well together. Like John and I, Paul had also lost a parent. His mother had died when he was quite young and he missed her terribly. Yet he didn't seem to have the chip on his shoulder that John had acquired. Paul lived with his brother and his father Jim who was a lovely man. Whenever we visited Paul's house Jim McCartney would be there with his pinny on, cooking eggs, bacon, chips and beans - the standard fare in a Liverpool household in those days - and we'd always be fed. Jim was a pianist and he'd played in a jazz band years before, so there was a lot of support and succour in Paul's home. John on the other hand was banned from practising his guitar in Mimi's house - if he must play he had to do it in the little square porch. Fortunately he said the acoustics were fabulous. As for George he had a complete, loving family behind him, so he escaped the traumas the rest of us had been through. In those days there were frequent meetings and practice sessions. Sometimes we'd go to John's stepfather's house when he wasn't home, climbing in through the downstairs bathroom window which John knew he always left open, we'd then make our way to the sitting room, There the boys would feed records into the record player and attempt to play along to the music. I was always terrified of getting caught but the boys seemed quite unworried. As far as John was concerned the only drawback was that there was never any food in the fridge and, like typical students, we were always starving. As well as private practice sessions they also played in public at every opportunity. There were a number of coffee bars and clubs in the area and they talked their way into them whenever they could. The Jacaranda, which was a downstairs coffee bar, was a frequent haunt. 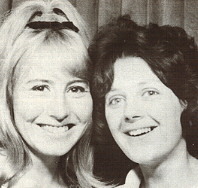 I was often dragged along to hold a microphone attached to a broomstick for them because the club had no proper mikes. Later of course came the Cavern. 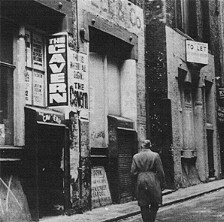 The Cavern was in Mathew Street, a cobbled back ally full of warehouses, lorries and litter. The entrance was tiny and you'd go down these narrow, uneven steps into a dim cellar smelling of damp and sweat. Water dripped from the ceiling and ran down the walls and the only light came from a few dull red bulbs. It wasn't exactly a healthy place but when the music got going the atmosphere was electrifying. I'd never seen anything like it. Girls would scream and rush to the front and I was always a bit nervous of going to the ladies because those Liverpool girls could be very tough, especially if they realised I was going out with John. Ever since he was at school John had played in a vareity of groups with various different friends but Paul and Paul's friend George had remained constant. 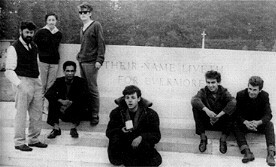 At one point before I started going out with John they were part of a group called the Quarrymen. Anyway, after a while John thought it would be nice to have his great college friend Stuart Sutcliffe join the fun. The fact that Stuart couldn't play a guitar didn't bother him at all. John admired Stuart. We all did. He was the most brilliant student in the college. He was only a tiddler - small, thin and spotty with glasses and floppy dark hair - but he had this tremendous energy and intensity about his art. He could do everything: painting, drawing, lifework - whatever he tried was fantastic. He really was the star of the place. At the end of the day the students would wander round the classes to see what everyone else was doing and you'd always find Stuart painting busily at some wonderful canvas. John was genuinely impressed with Stuart, and Stuart was impressed with John. So much so that when everyone else had gone home John would stay behind to learn everything Stuart could teach him. At the time, John's work was on a very small scale - little drawings and cartoons - but he was interested in progressing to something bigger. Stuart showed him what paints to use, what kind of mixtures to try and soon John was having a wonderful time, splashing bold colours across his canvas, throwing sand at it - trying out all sorts of experiments that he would have been too cautious to try in front of anyone else. That was the strange thing about John. he was such a great exhibitionist yet he was quite timid in other ways and nervous of being rejected. Stuart's one man "class" was the perfect education for him. Here with no one watching, no one to entertain and no one to criticise. John could relax and learn. I used to sit and watch them, fascinated but too happy in my chosen field of illustration to want to join in. Then, when they'd finished, we'd go for a drink or a coffee and then John would take me to the station to catch my train back to Hoylake. Stuart was such a wonderful artist that nobody could understand why he would want to take up music, but John liked to have his friends around him and he could be very persuasive. Besides, the music scene was blossoming and it was an exciting, exhilerating time to be involved. Stuart had been working so intensely and so long at his art perhaps he needed a break. Anyway, whatever the reason, he won an art prize and to the horror no doubt of the lecturers, used his �50 prize money to buy a bass guitar. Now it was John's turn to become unofficial tutor. Laboriously he drilled Stuart in the basic chords and, after many blistered fingers, Stuart eventually learned to play. But I don't think he was a "natural". He was so embarrassed by his lack of skill that whenever he performed he kept his back to the audience so they couldn't see his hands on the bass. It was around this time there came an incident we dismissed at the time but were to remember long afterwards. John came to meet me one day with his finger all swollen and bruised and his wrist painful. He didn't want to tell me about it and knowing how aggressive he could be, I thought he'd been fighting. Gradually I got the story out of him. Apparently the previous night he and Stuart had been outside a pub in Bootle when a gang of yobbos had started picking on Stuart. They knocked him to the ground and started kicking his head in. John dived to Stuart's defence and got his finger broken in the process. Fortunately, just then of course we had no way of knowing how serious it would turn out to be. Life was so exciting, something new seemed to happen every day and we were having so much fun living for the moment. John and I were very much in love. At Christmas he made me a beautiful card which he'd illustrated with a couple of little sketches of the two of us together. Beside the drawings were several pages of his chaotic handwriting: "I love you, I love you, I love you... I love you like mad... I love you like guitars... I love you like anything lovely... I love you forever and ever... I adore you, I want you, I need you..." And, touchingly, one whole page was devoted to the plea: "I love you so please don't leave me. I love you so don't leave me, leave me, leave me. Don't leave me. 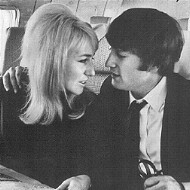 I love you, please don't go away..."
I knew he loved me, yet despite this even in those days John was a flirt. He couldn't resist chatting up other girls - usually blondes. I got so annoyed over one minor flirtation with a Brigitte Bardot-type that I finished with him. I don't think John could believe it. It was unheard of and it nearly killed me to do it but I stuck to my decision. I went home and refused to go out with him again. I wasn't happy but I tried to forget John. I even went out with someone else. There was a boy I used to see at the station in Hoylake, a trainee dentist, and he had a crush on me. I didn't know him very well but he used to wait for my train and follow me home. Anyway, he plucked up courage to ask for a date just after I finished with John. This was the boost my confidence needed. I had to rebuild my life, didn't I? I accepted. We went out for the evening and he was very nice but it was no use. He wasn't John. "It's no good," I thought sadly as I shut the front door behind him. "I'm not interested in anyone else." It wouldn't have been fair to see him again. Three miserable, lonely weeks went by, then late one night John phoned. He was in a call box and he sounded upset. He loved me, he missed me and he wanted me back. My depression vanished like fog in the sun. I didn't need any persuading. I'd missed him as much as he missed me. I drifted off to bed that night, the happiest girl in the world. But I never did tell John about the other boy even years afterwards. I didn't dare. No matter what he got up to, he would have been furious. Things got even better as far as we were concerned when I was 19 and moved into my own bedsit - unheard of freedom in those days. My cousin who'd emigrated to Canada had a baby and since she and her husband were both working, they invited Mum to come and join them as a nanny. Mum was desperately in need of a change of scene and she wanted to go. The only thing holding her back was me. "Pleas do go Mum," I begged her. "It's just what you need and I'll be fine. I can look after myself." So eventually Mum went to Canada and I took a bedsit in a terraced house in Liverpool. It was just one small room with a Baby-Belling cooker and a bathroom next door where you put a shilling in the meter for hot water that came out orange-brown with rust. It was a shabby little place, really, but it was my first nest and I loved it. So did John. We played house, cooking little meals on the tiny stove or bringing in fish and chip suppers. best of all, we had the freedom at last to sleep together whenever we wanted. It never occured to me that I might get pregnant. We were incredibly naive in those days, we knew nothing of taking precautions, and pregnancy never entered my head. We allowed ourselves to be swept along by passion with never a thought for the consequences. Miraculously, for a long time, we got away with it. All this time John was becomming more and more absorbed in his music. The boys needed a good name and one evening we were all sitting round trying to think of one. Buddy Holly had his Crickets and obviously continuing the insect theme Stuart suggested beetles, only swapping the second "e" for an "a" so that it was a little play on the word "best". The Beatles. They liked it but, for some reason, went on to embelish the name further by calling themselves The Silver Beatles, It was a bit cumbersome though and soon the word "silver" was dropped. The group became simply: The Beatles. I'd always thought they were wonderful but they were improving all the time and Allan Williams, who owned the Jacaranda and had connections in Hamburg, asked if they'd like to go and play in a nightclub there. There was very little money involved but the boys jumped at the chance. They'd never been abroad before and they knew the experiance would be good for them. There was only one problem. They were short of a drummer and they couldn't go without one. At the last minute they were introduced to pete Best, whose mother owned yet another of the fashionable coffee bars. Pete, although rather quiet, was a skilled rummer with dark, brooding good looks. To everyone's relief, he agreed to go. I was very sad to see John leave. As I waved him off in the van that was to transport the boys and their equipment overland to Germany I couldn't help wiping away a few tears. I knew I'd miss him dreadfully and I was worried that he might meet someone else but, at the same time, I was glad for him. This was a wonderful opportunity and I didn't want to hold him back. Besides, I was going to be very busy. I was in my last year at college and a few weeks away from John would give me time to catch up on all the work I'd missed. There was also John's work. The college had allowed him to finish his lettering for the exam in his own time. But typical John, instead of doing it himself, he tossed it over to me to complete in his absence. I was in despair when I saw it. The paper was tatty at the edges and screwed up, there were blobs here and blobs there. It was absoloutely ruined. I spent hours and hours trying to make something of it but it was no use. For all my improvements John still failed. But he had more tasks in mind for me. Soon, along with his daily love letters came urgent requests for more songs. The group was playing all night in Hamburg, working such long hours that they were burning up their material at a tremendous rate. "Could you send me the words to Ketty Lesters' Love Letters?" John would implore one week. The next is was smething by Sam Cooke. So I'd end up buying all these discs and playing them over and over again and slowing them down so that I could catch every single word and copy it out for John. It took hours but I didn't mind. I loved the music and I loved to help. And through it all I was happy enough. I lived for the postman and those lovely letters and although I know now that John got up to all sorts of things in Hamburg, at the time I had no idea. I was secure in his love for me and naively assumed that loving me the way that he did, he wouldn't look at anyone else. That trip to Hamburg was to be the first of many. John came home full of love and bearing a beautiful leather coat for me and a cooked chicken for Mimi - a gift which didn't go down at all well with his aunt who felt that the presents should have been reversed. In an angry exchange she accused me of being a "gangster's moll". He also came home to a letter from college telling him not to bother to return since his mind was obviously not on his studies. John just shrugged. What did he care? Soon he'd be back in Hamburg and next time perhaps I could come out and join him. At this time Paul had a girlfriend called Dot who'd got a bedsit in the same house as me. Dot worked in the chemist's nearby. She was a tiny little thing with a very pretty, pixie face, short blonde hair and huge puppy-dog eyes and we'd become good friends. Anyway as the plans for my Hamburg trip progressed, it was decided that Dot would come, too. John and the boys went on ahead and as soon as my Easter holidays from college came round, Dot and I set off in high excitement for Germany. 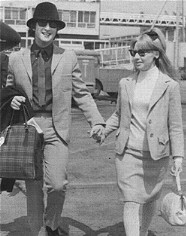 We'd never been abroad before and Paul's father, dear Jim McCartney, was so worried to think of two such young girls travelling alone that he insisted on taking us to London and putting us on the boat train himself. It seemed a very long journey through the night and I remember little of it except this endless string of foreign stations where trollies of food stood tentalisingly on the platform. Yet, starving as we were, Dot and I didn't dare get off to buy something in case the train pulled out and left us behind. Needless to say we were very, very hungry by the time we got to Hamburg and that breakfast at the Sailor's Mission was extremely welcome. John and I couldn't stop hugging. He was very loving and the aggression that was normally so near the surface seemed to have faded. He'd grown up a bit and gained self-confidence. The Beatles were doing well. They were achieving a good sound, they'd moved to a better club, The Top Ten, and even their sleeping quarters had improved. At first they'd been allocated an appalling, windowless room behind a cinema screen. Now they'd progressed to a larger place complete with six bunk beds. It wasn't exactly luxury but it was a lot better. Dot and I gulped down our eggs, chips, tomatoes and toast listening admiringly to the German words the four of them had picked up and their exciting tales of the tough world of the Reeperbahn. After breakfast we went off to see our accomodation. For some reason Paul had found Dot a houseboat, while John thought it would be nice for me to stay with their new German student friend, Astrid Kircherr. I was very curious about this Astrid. She'd cropped up again and again in John's letters home. Everything was Astrid this and Astrid that. Astrid was taking wonderful photographs of them, strid had such good taste - until I'd become quite jealous. Anyway, we strolled back to the Top Ten club and as we arrived outside, a little Volkswagen pulled up beside us and a beautiful girl got out. Slim and graceful she had very short blonde hair, perfect features and her clothes were sleek and elegant. I studied them discreetly. Astrid dressed with deceptive simplicity. She wore a black leather coat, tight blue jeans and white tee-shirt, yet somehow, on her they looked special. I was impressed and when Astrid spoke the effect was even more charming. 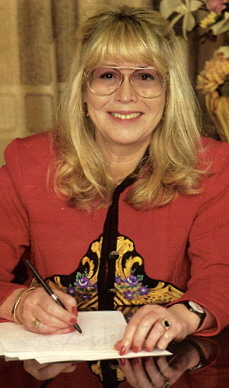 She spoke English with a German accent to which had been added a twang of Liverpool. She was very sweet, she was always laughing and smiling and within minutes I forgot my fleeting jealousy. I liked her. John and I squeezed into the Volkswagen and Astrid sped us back through the busy streets to the large red-brick house where she lived. Now I was even more impressed. Astrid's parents were obviously wealthy. The house was very grand with big windows, chandeliers and antique furniture and Astrid had the top floor to herself while her mother lived downstairs. Slightly dazed I followed Astrid up the broad stairs to the bedroom she'd set aside for me. I dumped my case on the bed and turned as she flung open another door. "I expect you'd like a bath after your journey," she said. Over her shoulder I caught sight of the biggest bath-tub I'd ever seen and, before I could answer, Astrid was turning on the taps and splashing a strange green gel into the water. Suddenly the room was filled with the most lovely scent, quite unlike anything I'd ever come across before. I'd never heard of bath oil. Such pampering and luxury was quite outside my experience. Minutes later, I lowered myself happily into the silky, sweet-smelling water, wondering if perhaps I was asleep and dreaming. From my tiny bedsit in Liverpool to this elegant German house was almost too great a contrast to take in. The whole holiday was wonderful. Our feelings were running very high. We were emotional and intensely happy. By day John showed me the sights of Hamburg - including the streets where women don't usually go because they're full of prostitutes selling their wares from shop windows. I went around with my eyes and mouth wide open in astonishment. We went to the fair, Astrid took us to the beach in her car... There was a lot of fun and lunacy and silly dancing round the streets. In the evenings, Astrid and I would dolly up and go to watch the boys play. I'd particularly admired a beautiful frilly white cotton blouse of Astrid's and she insisted on lending it to me. "You must wear it," she said. So I put on the white blouse with my black velvet trousers and at about ten o'clock we'd met Dot and set off for the club. A table had been reserved just for us and this very tough braman/bouncer had been instructed to act as our minder. If any drunken sailors came over or anyone attempted to mess with us, the barman would come straight over and push them away. I was fascinated to see how the Beatles were improving. Chivvied on by the club boss: "Mak shau! Mak shau!" (Make show, make show) every time a break went on too long, they pushed themselves to the limit to play for eight hours at a stretch. Under pressure they'd become more professional and they were achieving a fabulous effect. Even though they hadn't yet progressed to using their own songs they were producing a sound that was special and unique. John had always been a bit self-conscious about his voice before. He didn't think he was a wonderful singer but now you could tell that the group wouldn't have been the same without it. Nevertheless, exciting though those evenings were, I doubt whether we'd have been able to stay awake all night every night without a little help. We managed to get hold of some Preludin - speed - so there we were sipping beer and as the night wore on we'd take half a "prely" to keep us going. Soon my heart would be racing and I'd feel giddy and hyped-up and silly. Mind you, on one occasion the combined "prelys" and booze had a dramatic effect. I woke up next morning to find that the zig-zag wallpaper in my room was zig-zagging about in an alarming manner, every line dancing independently of the line next to it. And everything else I looked at seemed to be moving. I felt terrible and it took all day for things to settle down. I gave up the prelys after that. But this was my only unpleasant experience. Everything else was magical. My earlier faint jealousy of Astrid had melted away. It was Stuart she was interested in, not John. Stuart and Astrid were quite clearly madly in love. 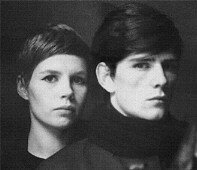 Stuart was so besotted he'd even let Astrid cut his hair into a strange pudding basin shape with a fringe. The others fell about laughing when they saw it and teased him unmercifully. But it wasn't long before they were all adopting the same hairstyle. It was to become their trademark. Under her influence they'd also taken to wearing moody black. I thought it suited John. He looked great. But then I was in love and it wouldn't have mattered how he looked. The days raced by and soon it was time for Dot and I to go home. There were more tears as I said goodbye to John and I was also sad to leave Hamburg. I'd fallen in love with the place. I loved its naughtiness and its brash exterior. It held so many happy memories. I love it still. Unknown to me, this was to be the pattern of our relationship from now on. Sad partings and joyful reunions. And one such joyful reunion was to have dramatic repercussions. In the Summer of 1962, the day before I was to sit my third and last exam, John came home full of the joys of Spring. Ecstatically we fell into bed and we didn't sleep the whole night long. And at some point during those passionate embraces, something strange happened. It's very difficult to explain. It was just as if something went "click" inside me and my body felt different. At the time I couldn't understand what it was so I said nothing to John. Anyway, the next morning I dragged myself into college and actually sat the exam but I was in no fit state. I was so much the worse for wear I couldn't concentrate on my paper. Nevertheless, in my optimistic way I hoped for the best. John went back to his travels and life continued as usual for a few weeks until I began to notice other odd things. My period got later and later and still didn't arrive and then I started being sick in the mornings. A horrible suspicion began to creep over me. I couldn't... surely I couldn't be pregnant? That only happened to other girls. Not me. I was going to be a teacher soon. Worried, I contacted Phyllis. I didn't even have a doctor in Liverpool and I didn't want to go back to Hoylake where everyone knew me and might talk. "Never mind," said Phyl, "I'll take you to my doctor. She'll see you." In those days falling pregnant before marriage was a shameful thing - the ultimate disgrace for a girl. I couldn't believe it had happened to me. There must be some other explanation. So Phyl made the appointment for me and as we set out early in the morning for the doctor's surgery, we met the postman coming in. There was a letter for me. Thanking him I stuffed it in my pocket and hurried off after Phyllis. On top of the bus I ripped open the envelope. It was my exam results. I'd failed. Miserably I stared at the dreadful words. After all my hard work, after all the sacrifices Mum had made. I felt dreadful. I'd let myself down and I'd let Mum down. Tears came into my eyes. Phyllis seeing my distress took the letter from me. "It's not so bad, Cyn," she said, skimming it quickly. "You've only failed the last exam. You can always take it again next term." I looked at the letter again. She was right. It wasn't the end of the world. It was only one little exam. Next term I'd work really hard and make damn sure I passed. Feeling more cheerful I put the letter back into my pocket. It was a small setback, nothing to worry about really. Soon my career would be back on course. Then I walked into the doctor's and got the final shattering blow to all my hopes and dreams. "I'm sorry to tell you Miss Powell," said the doctor, looking at me disapprovingly, "that you're pregnant." NEXT WEEK: We get married. rescue and the Beatles take off.